An n-gram is a tuple of n consecutive words. For example, a bigram (the case when n=2) is a pair of consecutive words such as "heavy rainfall". A unigram (the case when n=1) is a single word. A bag-of-n-grams model records the number of times that different n-grams appear in document collections. Using a bag-of-n-grams model, you can retain more information on word ordering in the original text data. 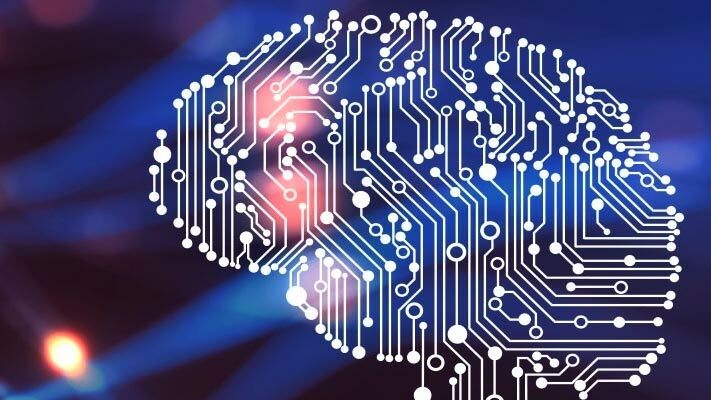 For example, a bag-of-n-grams model is better suited for capturing short phrases which appear in the text, such as "heavy rainfall" and "thunderstorm winds". To create a bag-of-n-grams model, use bagOfNgrams. 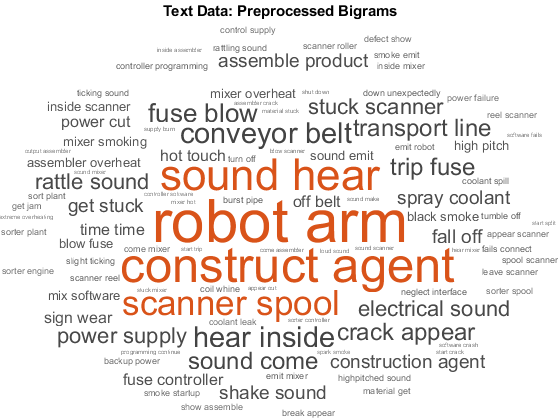 You can input bagOfNgrams objects into other Text Analytics Toolbox functions such as wordcloud and fitlda. Load the example data. The file weatherReports.csv contains weather reports, including a text description and categorical labels for each event. Remove the rows with empty reports. Extract the text data from the table and view the first few reports. Convert the text data to lowercase using lower. Create a word cloud of bigrams by first creating a bag-of-n-grams model using bagOfNgrams, and then inputting the model to wordcloud. To count the n-grams of length 2 (bigrams), use bagOfNgrams with the default options. Visualize the bag-of-n-grams model using a word cloud. 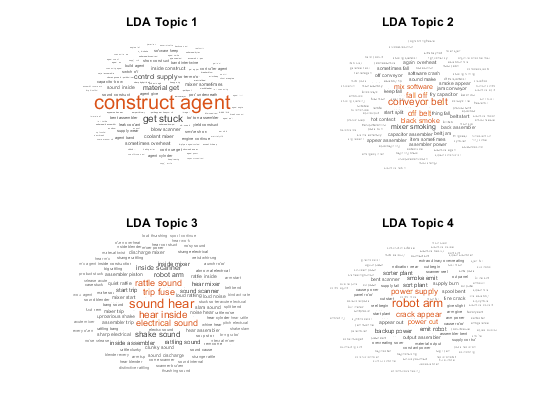 Create an LDA topic model with 10 topics using fitlda. The function fits an LDA model by treating the n-grams as single words. Initial topic assignments sampled in 0.741989 seconds. 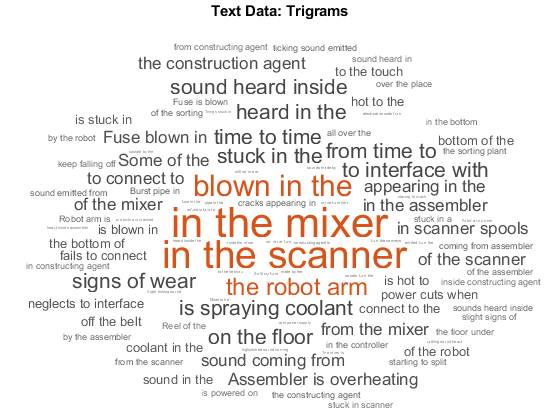 Visualize the first four topics as word clouds. The word clouds highlight commonly co-occuring bigrams in the LDA topics. The function plots the bigrams with sizes according to their probabilities for the specified LDA topics. To analyze text using longer phrases, specify the 'NGramLengths' option in bagOfNgrams to be a larger value. When working with longer phrases, it can be useful to keep stop words in the model. For example, to detect the phrase "is not happy", keep the stop words "is" and "not" in the model. Preprocess the text. Erase the punctuation using erasePunctuation, and tokenize using tokenizedDocument. To count the n-grams of length 3 (trigrams), use bagOfNgrams and specify 'NGramLengths' to be 3. Visualize the bag-of-n-grams model using a word cloud. The word cloud of trigrams better shows the context of the individual words. View the top 10 trigrams and their frequency counts using topkngrams. % Convert the text data to lowercase.